This page describes how to use Processing Fee Waiver Coupons for A' Design Competition and Award. 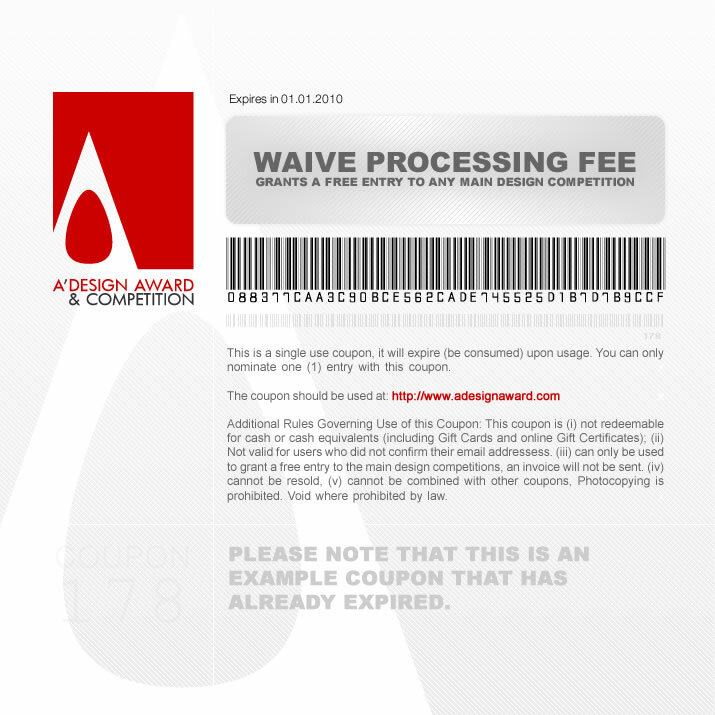 Processing fee / payment waiver coupons are free entrance coupons, using these coupons you do not need to pay any fees for nominating your design to the A' Design Award. These coupons are distributed at events, conferences and exhibitions, they are also given to suggest-a-talent campaign winners and design ambassadors please note that these are usually Digital Edition tickets. Step 0: You should upload your design first, fill in details and descriptions. Step 1: From your control panel, go to nominate a design page and click the design you want to nominate. Step 2: There is a link under this page, next to the nomination button that says: "If you need to pay with other methods (such as Bank Transfer, Electronic Money etc) click here." click on that link (this is a dynamic link that changes with each design). Step 3: A new page "Payment with other methods" will appear, choose Award Category and continue by pressing "CONTINUE PAYMENT" button. Step 4. In this page, from the "Payment Method" menu choose "Processing Fee Waiver Coupon". Step 5. Enter the"CODE WRITTEN ON THE BARCODE (40 CHARACTERS)". to AUTH/REFERENCE CODE field and press "CONTINUE PAYMENT" and we will manually confirm the transaction afterwards. You do not need to make any payments, just wait for confirmation. Please remember that each Coupon is different and has different barcode and authorization code numbers. Each Coupon can only be used once. Click here to go to nomination pages.